Join us as we celebrate our 50th anniversary! Can you believe it?? 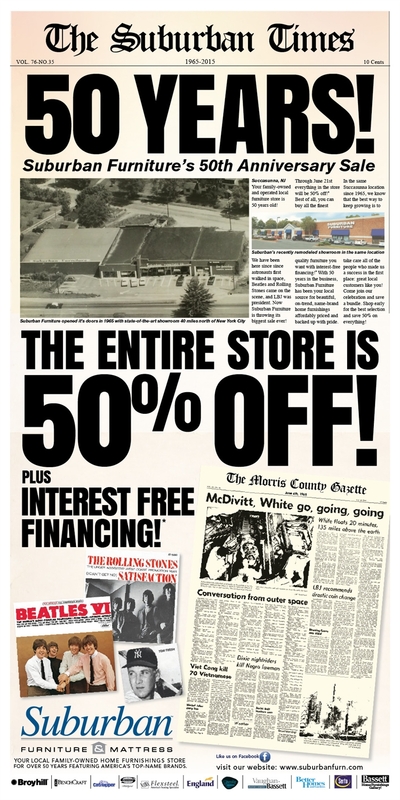 The entire store is 50% off in honor of this important milestone so be sure to stop by and check out our offerings. With top name brands and interest free financing, you can’t go wrong! Suburban Furniture has been serving the Roxbury Township, Morris, Warren and Sussex County and Northern New Jersey areas for 50 years. Our customers value us for our large selection, beautiful showroom, fair prices and immediate delivery. Still family owned after 50 years we are committed to providing a unique, family friendly, comfortable place to shop for your home. Our caring staff, combined with affordable, in-stock furniture will help you furnish your home in hours, not months. Our showroom has been awarded Best Retailer/Showroom awards from the Metropolitan Furnishings Association several times. You can expect to see items from all different categories including adult and youth bedrooms, dining rooms, dinettes/kitchen sets, living rooms, recliners, sectionals, sofa beds, entertainment centers and TV carts, mattresses (including the famous Tempurpedic Sleep Systems), cocktail and end tables, home office, accent pieces, lamps, pictures and art. We’ve got it all. We also offer Same Day Delivery service which has eased the burden of waiting weeks or months for furniture. We know that once you fall in love with a piece of furniture, you want it right away. That is why 90% of what you see in our showroom is in stock, in the fabric and finish shown, for Same Day Delivery. If you don’t fall in our Same Day Delivery area, don’t worry. Most all other towns surrounding us in Morris County, Warren County, and Sussex County can be delivered to the following day. See our Same Day Delivery towns below. For those of you who don’t mind the wait, many of our showroom’s items’ finishes and fabrics can be customized to meet your specific decorating needs. Finally, because our community has treated us so well over the years, we like to give back through support. We belong to the local, state and national Chambers of Commerce. We have contributed to local charities and charitable functions, including the Roxbury and Randolph schools, local churches, Rotary Club, Knights of Columbus, youth sports teams, the Morris County College scholarship fund, Market Street Mission, the Salvation Army, and St. Clare’s Hospital, just to name a few. We have also sponsored Child Safety Day here at the store with the Roxbury Police for several years. Thanks for shopping Suburban Furniture!